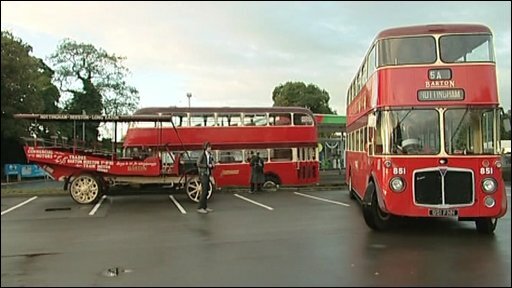 A relay of historic buses has taken place to mark the centenary of one of the East Midlands' oldest bus firms. 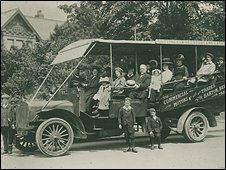 The first Barton bus ran from Long Eaton in Derbyshire to Nottingham's Market Square on 1 October 1908. The journey was recreated by buses and coaches - some in the original red, maroon and cream livery - from every decade, becoming more modern in turn. The route was set up to take people to the Goose Fair, which traditionally opens at the start of October. Barton's buses - now Trent Barton - was for many years the largest independent bus operator in Europe. Simon Barton, managing director of the company, said: "Getting these vehicles together and seeing how basic they were really underlines what a step into the unknown the service was. "They [the Barton family] had been putting the company together for years but on that first morning they had no idea whether anyone was going to turn up."